Coming Soon: Cooking Planit T-fal Giveaway! Alright, y'all. Have I got some exciting news! You're going to love this. Like love love. 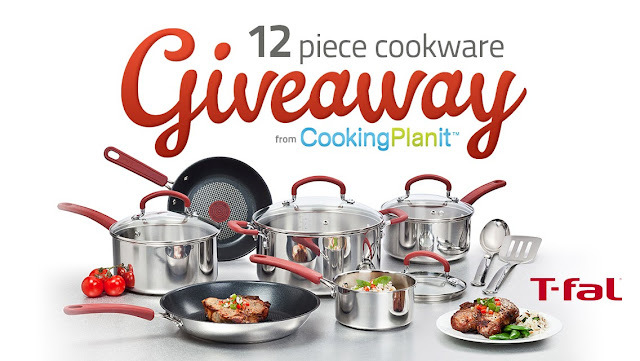 There is an amazing contest running with Cooking Planit and T-fal (starting today!) that I am so excited to be a part of. I'll be giving away (drumroll, please) a brand new set of T-fal cookware and promoting a super cool cooking app called Cooking Planit! I assure you, you want both of these in your kitchen! First, let me fill you in a bit on Cooking Planit. Now, if I had had the Cooking Planit app, things would have gone so much more smoothly. You see, Cooking Planit takes all the guess work out of getting a full meal to the table on time. Every step of preparing a meal, from creating your shopping list to step-by-step directions during the prep and cooking, are provided through the app to make sure that all of your dishes make it to the table at the same time. Sounds good, right? It really is cool and perfect for everyone. Learning to cook? The step-by-step instructions help you to figure it all out. Hosting a party? Let the app help you get everything done so you don't spend all your time in the kitchen. Busy parent? Simplify your planning and shopping so you're not frazzled before you even start cooking. Check it out Cooking Planit on the web or get the FREE VERSION on your ipad or iphone. I'll be filling you in more on why I love Cooking Planit in an upcoming post, so stay tuned! Now, let's take a closer look at the take for this giveaway. I'll be telling you a little more about this set in an upcoming post. Until then, you can check out more about the products here: T-fal Stainless Steel with Thermo-spot 12-Piece Cookware Set. Remember how I said you had 50 chances to enter? Good odds, people. Let me explain. There are 50 bloggers giving away these sets of cookware. You can enter once on each blog! My giveaway starts on the 23rd, so be sure to check back to enter! Until then, head on over to the other blogs and get your entries in!